This two bedroom Edwardian house accommodates 1 to 4 people in luxury and is truly a hidden gem. Breaks here are aimed at families or couples. The setting is not suited to hen, stag or any other type of party. Wireless broadband, central heating, parking and garden. Situated in a quiet beautiful square within walking distance of Manchester centre or a stroll to direct buses or trains. 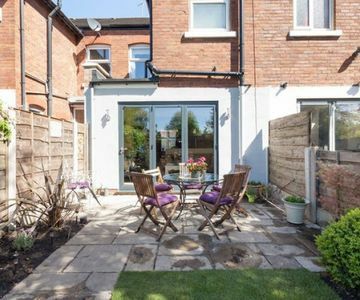 Situated in a quiet beautiful Edwardian square within walking distance of Manchester centre, or alternatively you can catch the frequent direct buses or trains which are an easy stroll away. Our immaculately maintained property is set in a very quiet and restful area, with its own free parking on the cobbled drive. Luxury greets you at the door as you enter the light, open, peaceful space. There is fast wireless broadband, central heating, two beautiful bedrooms (one with a king size bed the other with a double bed) and a tasteful bathroom. The kitchen has everything you may need, including basis essentials like tea and coffee and a few food supplies, including a coffee machine which uses Nescafe Dolce Gusto pods, available from any large supermarket. Large bi-fold doors extend across the rear, looking out onto a terrace with a round glass table and wooden chairs. There are pot plants and a well-stocked garden. All fresh bedding is provided, along with abundance of soft fresh towels and a couple of robes. A couple of hair-dryers are available.